I doubt if anything we see during March Madness will be half as amazing. Thank you, SY. 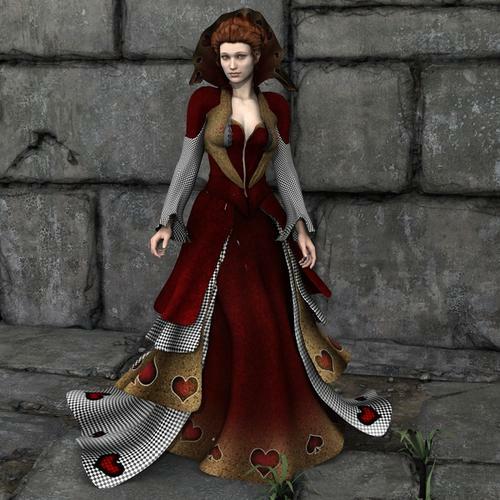 I have always trouble with the collar and the skirt of "Wonderland Queen of Hearts V4" (http://www.daz3d.com/wonderland-queen-of-hearts-v4) , when I use it on Genesis with Autofit. I don't know, if you have that outfit, but if you have it, could you post a picture how it will look after a "re-run" through your tool? I've already spent too much buying stuff to test this on. My educated guess (based on other outfits) is that it will do fine with the giant skirt but no automation will ever deal with that collar properly. It will be auto-rigged partially to the head when it needs to be painted 100% to the neck, and that's only going to happen if you fix it manually. I'm very happy with the way it handled the FBMs; shown here are Aiko 4, Freak 5 plus Superfreak, and a mix of Julie and Basic Child. Just picked this up. I wish that your Daz store was as large as your Rendo store, but I did take the chance to use the sale to grab a couple of your other sets. Really looking forward to trying out some of the features, especially the rigging. I would love for more of my long dress outfits to have better controls, and fitting obviously. Thanks for all the great products! Well, I'm working on that part. ;) Thank you for your purchase! Have to wait for playing with it, a render is running. Worked perfectly on M4 Workingman boots and M4 Hardcode boots. I just tried it again with the freebie Pretty3d pirate outfit boots exactly as written and it worked fine. Are these 30's shoes .cr2s? Good point (Checking) (they are in the "figures" part, but you never know (PC items) 30s everyday dress and 30s Fortune teller. 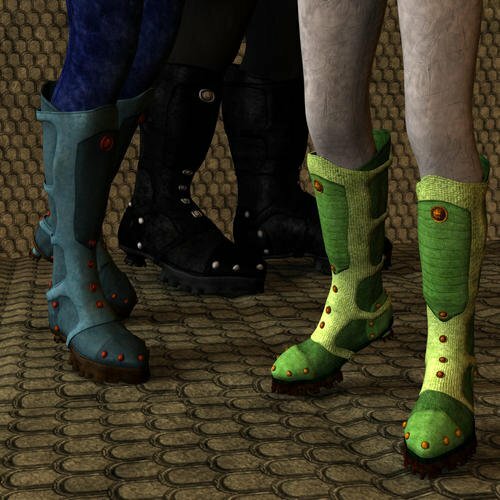 Maybe you have them, they are "low shows with a small heel", I dont have that much "skimp wear boots" to test with, but some scifi boots for V4, will try them. So tried Brazen V4 boots, no problem. No, I don't have those (and after the first month of testing, I can't afford to buy each outfit people will use it with, as there are hundreds). But for it to be working with the other boots says you are doing the process correctly, and it's an issue with those particular shoes. I don't know what their issue is. 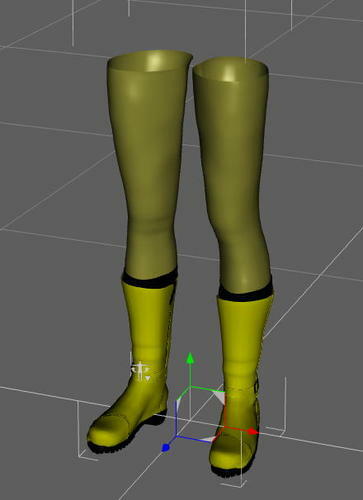 Did you try it with both pairs of rigging boots (the toes and the no-toes)? EDIT: Oh hey, they're $1.40. Let's see what we can do. I'll knock off Wonderland Queen of Hearts while I'm at it. 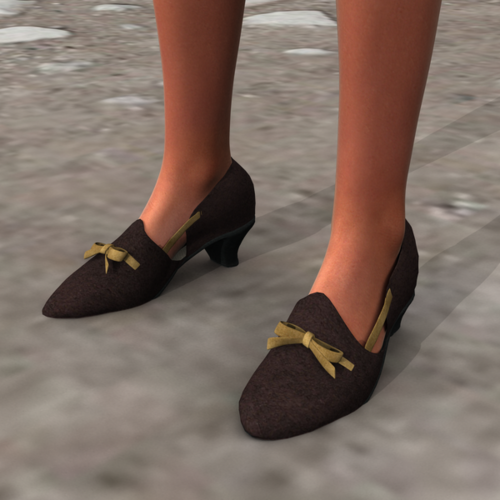 Great (as I'm desperately short on 30s shoes that fit genesis (now over to the dress and apron, haven¨t tried those yet. It worked fine on both the FortuneTeller and the 1930's Everyday shoes for me going from the NoToes boot base. 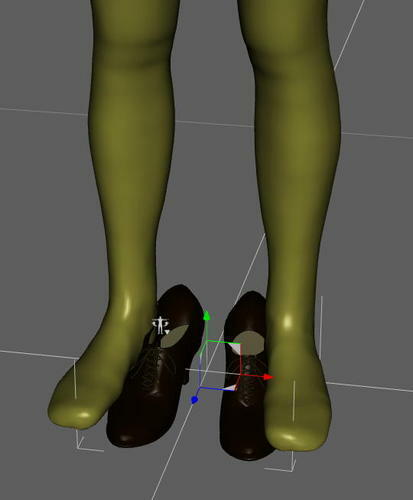 Here they're on V5 with the adjustment morphs used to improve fit and the High Heels pose that came with SRMS. As expected, QOH does great with the skirts, not so much with the giant collar. One can fix it manually, but you have to be willing to select those problem verts and go fill them manually 100% to the head and then 0% to all the collar and forearm rotation and bulge groups. It's a bit of work. One pet peeve I have is with Gen 4 shoe conversions using Autofit. 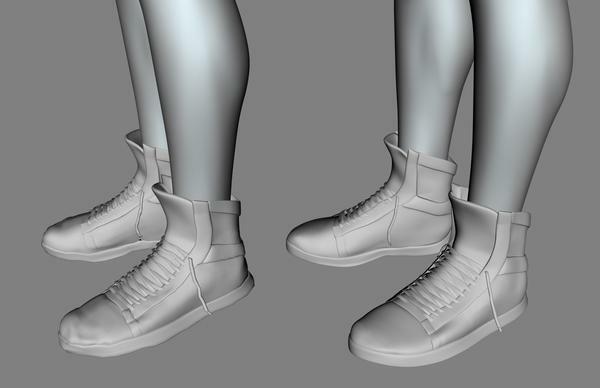 I used the Sickle Rigging and Morphing System transfer utility two step process to convert M4 BadBoy shoes to Genesis. Autofit conversion on the left and Sickle Rigging and Morphing system conversion on the right. Both on Genesis with M4 shape. 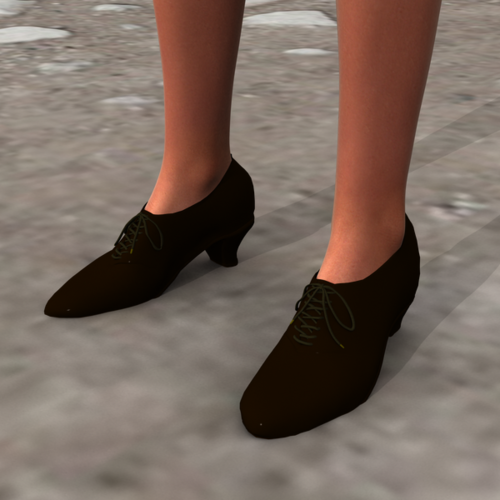 I dialed in/out other male shapes and the shoes auto-followed perfectly without adding any additional morphs provided with the product. Thank you for this innovative product SickleYield! I knew people were going to want the conversions most :D I'm glad you're pleased with it! You can get some really nice results with it, and I've been able to start using some things I got and then promptly abandoned because I was mainly using Genesis, and Autofit was just mauling everything. Sensibility and overskirt on the left, Night World Mourning Sun on the right, both transferred with SRMS. (And I'd totally forgotten that the Mourning Sun skirt had splits like that.) With Mada's Essence in the background, just because. Thank you for being so incredibly awesome. have so so many of genesis products here but mostly the ones at rendo.... you have way more stuff there and i follow you at rendo pretty obsessively! hah..... ^^ Thank you!!! Picked this up, looks extremely useful, now to print off the pdf and see what I can learn. Note for DIM users: As of this moment, it seems that only 2 of the three files needed show up in DIM. So you need to download and install at least the one file the old way. Yup. I wasn't even sure if this would be included with DIM. SO I downloaded them all via the Download Account area at DAZ directly. Then was downloading my other purchases and realized that 2 of the 3 files were actually in the new batch. Oh well. I'm not sure if it would pick up the manual through DIM. You might all have to get that manually (no pun intended). I love seeing people's renders! I had a query via PM asking me if people could use this commercially. If anyone else was unclear, YES YOU CAN. You can't rerelease the templates or clothes that come with it, and of course you can't sell someone else's v4 stuff, but you CAN use it to rig and morph your own Genesis clothes (as Fuseling has, and as I now do)! Just don't forget to delete unwanted morphs before release, because it will add every morph it has to every item regardless of whether the item is, say, a pair of pants that technically doesn't need breast morphs. They'll be in the data files area where you saved your new item. Has anyone tried this in Carrara 8.5 with Genesis? I wonder if it will work.